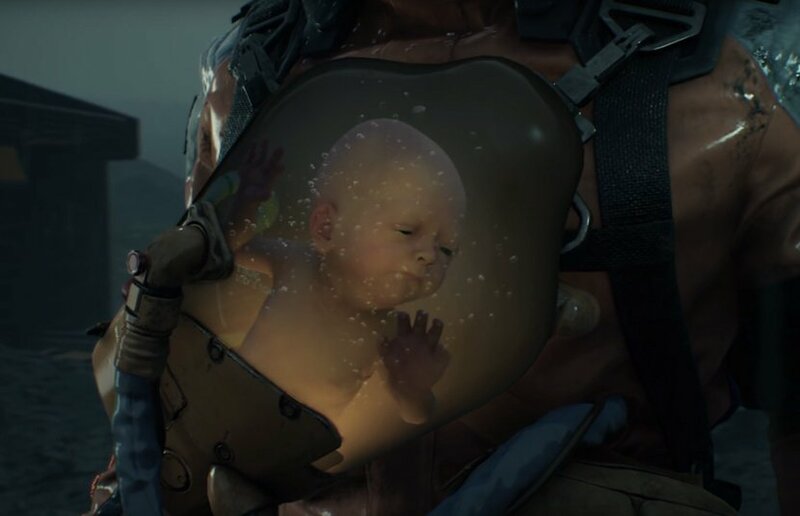 Guerrilla Games and Kojima Productions have the best bromance in games, with the former famously lending veteran director Hideo Kojima and his team Horizon: Zero Dawn’s acclaimed Decima Engine for use in Death Stranding. It means that the companies have a water-tight relationship, and spend a lot of time visiting each other’s respective studios. Kojima is currently in Amsterdam, and he’s been showing Guerrilla Games how his PlayStation 4 exclusive is progressing. The response has been enthusiastic to say the least, with managing director Hermen Hulst stating that he’s “so impressed” with what the Japanese developer’s been up to. Horizon: Zero Dawn’s game director Mathijs de Jonge added that the demo left him “speechless”, while lead combat designer Dennis Zopfi described it as “intriguing, beautiful, touching, mysterious, amazing, artistic, thrilling, engaging, inspiring, [and] masterful”. Of course, no one was going to say that the game looked bad, were they? Still, this is high praise coming from some of the gaming industry’s biggest names, and with Kojima appearing to actually demo the title on a DualShock 4 in the photos, it suggests that the playable build of this hotly anticipated title is really beginning to come together. We can’t wait to learn more. Really nice story of gaming bringing creative teams across the world together. Can't wait to see what they've come up with. Man, I can't wait to finally see this game in action. all together now.. group hug!!! "lending" as in giving away for free and being honored by Kojima's gushing over it. It was a perfect move to make and we should recognize the ingeniousness of the move by Guerrilla's managers (yes, the engineers made it, but the managers were capable and forward looking enough to get the best exposure for the engine that a company could hope for). Kinda crazy that guys are taking their crazy game engines and moving them around in a tiny little box. I, too am very interested to see more of this game. I bet some of the things Kojima's people were able to achieve with Guerrilla's engine will find their way back into the next Horizon game. @jly1987 I don't think that's true at all, you're entitled to your opinion but to say other people over scored a game because the scores don't match your with your opinion is wrong. Mgs5 is probably one of the best games to come out this gen and probably just one of the best 3rd person tactical shooters to be made. Personally I didn't like it that much because of pacing issues and the repetitiveness of the second half. But the game is definitely worthy of the 8's and 9's it got. @playstation1995 Pretty sure they own both insomniac and kojima productions hence the two exclusives...... The others clearly have a working relationship with Sony so I don't think they need to buy them. Quite a few people must be 'speechless' realising the game development is doing well. Its a ps4 game indeed and I think its even close to be fully playable. @jly1987 Totally agree with the Nintendo point but Kojima's games are genuinely creative and unique rather than basically being level packs for the same Mario game released as full games, and barely different waves of Pokemon games. On a related note, I'm loving BotW but I also totally agree with Joseph Anderson's in-depth review on YouTube. Give it a watch if you like, you'll probably find yourself agreeing with it all, though it's very long. Nice to know that developers are easily impressed with more walking simulator gameplay. Your basing purely off your own opinion of why the game is bad. At the end of the day reviews are just opinions and to say the game overscored or got a pass or whatever you want to say just cause "kojima" is plain wrong. The game wasn't even praised for the things you're complaining about. It's pretty much universally accepted that story wise this game is kind of weak but ultimately the gameplay is what got those high ratings. It was also a lot more accessible to someone who had never really played a metal gear before. It is definitely one of the best action games of this generation name me another 3rd person tactical shooter where you can approach a situation in so many different ways. Hell just name me another action shooter game where you can do the amount of stuff you can do in mgsv. I seriously doubt you can maybe, wildlands. It is so highly regarded because of the gameplay if the pacing and story were better it would probably be regarded as one of the best games ever made. It would be more proper to say "I think his games/mgs5 are/is overrated" Than to put it the way you put it which comes off more as statement. And basically amounts to you saying my opinion is the valid one and if you don't agree your wrong. @CK97 Yes the game must be one giant walking sim. Despite the trailer that literally showed a stealth section. @jly1987 @Thatblackguy121 ehhh I'd say if you look at MGS5 in the context of the series as a whole, and Kojima's apparent godliness, it was a blatant failure, despite having some good ideas and really quite fun moment to moment gameplay. As for Death Stranding I am completely without opinion right now. Actually a bit bored of it, even. Wish it would just come out so we can see if it's good or not. @Matroska I don't think that's fair either. Mario odyssey was a great game and totally deserved its high ratings. Pokemon hasn't changed because it has a diehard fan base and to change the core of the game would alienate those players. So the idea for pokemon is more to play with the formula and see what they can change whilst still leaving the core gameplay as is. Sun and moon do a good job of this. A solid storyline, removing gyms and replacing them with trials getting rid of hms. The game felt somewhat fresh and I struggle to play through pokemon games because of how many I've played. You can't really use ovverated as a statement because you're implying everyone who disagrees with you is in the wrong. Also their are plenty of side games that don't play like typical pokemon/mario. Mainline games in a long running franchise are gonna be similar to previous games but people never seem to talk about all the spin off games that Nintendo make or publish. @kyleforrester87 That's not judging the game on its own merits is it. If you compare it to previous games it's poor in story and its repetitive but its an open world game and that's par for the course. And 5 is a 3rd person tactical shooter. If anything it's not a blatant failure it's a game that actually managed to succeed and be a good game despite all the bull surrounding it. Your idea of a failure is clearly way different to mine. I said this to the other guy but you can't use your opinion as fact because your then implying that opinions that don't line up with yours are wrong. He's definitely one of the best in the industry but I'm pretty sure most people can agree he's not perfect. @kyleforrester87 Deathstranding is something I'm looking forward to. But I'm neither riding a hype train or on the "euuugh it's just a glorified walking sim"
It has potential to be a masterpiece it also has the potential to be some self indulgent garbage. @FullbringIchigo : the only valid comment. Zopfi with the superlative overload. Instead of indulging in some vomit inducing industry backslapping how about the game being shown to the general public? Maybe a release window or a tiny bit of story information? @Thatblackguy121 opinions are opinions, we're each entitled to our own of course but games don't exist in a vacuum and I don't believe MGS5 was close to its full potential. A fun game, but it could and should have been more. Not bad, but a failure none the less in my eyes. It disappoints me saying that as I was really looking forward to it. @Thatblackguy121 I really recommend you search YouTube for "Joseph Anderson Mario odyssey" and the same for BotW. The games are deeply flawed and both have 80% or more of their content based around doing the same menial tasks for repeated slow drip feeds of the same reward. Also things like how BotW really only has about 4 or so weapons and how the vast majority of your fights are against the same 3 enemies. They're long but very professionally and intelligently written and edited. And by the way, I love BotW - I even bought that expensive boxed set thing of the book, map, spirit orb etc. RRP £80 but i got it for £50. But it's insane how many people overlook its myriad flaws. That's why you can actually say overrated, because in another game's review they focus on those same flaws with laser intensity. They also praise it for things pretty much every other game does. Like one review that was enraptured by how "what each enemy is holding changes what they are capable of", as if that isn't true of, say, CoD and games as far back as Streets of Rage. And, you know, any other game where enemies have different weapons. But in BotW, it was an amazing feat of game design, apparently. But yeah, Joseph Anderson's reviews show it better than I ever could. @Thatblackguy121 @Matroska sorry to say it but I have to disagree that BotW is overrated. I’ve read and watched a few opinions and analysis on BotW and the “flaws” that are pointed out are mainly just someone’s opinion. And if we micro analysed every game we could say the same things about all of them. We just don’t realise it because our experiences/opinions/mood/expectations blind us to the reality. The truth is that every game is repetitive. That is literally what games are. Completing the same tasks over and over but in different scenarios. If you don’t like the tasks you generally don’t like the game or get bored of it. You highlighted the weapons as something done in other games, but BotW did unique things with it where the AI actively changes its tactics based on what weapon is in their hands and what weapon is nearby to them and how they are attacked. Yes, it isn’t the most sophisticated they could make it, but it also is very sophisticated compared to most games and it does this as one of the many things it does well. It links a whole wealth if minor features and marries them all together. The fact you can run up to a tree and take an apple from it, put that apple on a fire and it cooks it, combine it with other ingredients to create numerous food items, freeze it in snow or just drop it in water and watch it float away. These kinds of physics rarely feature in games and yet BotW allows it with all its items in a massive open world. It also allows you to attack enemies with all the traditional weapons but also a host of new physics based “weapons” with the Sheika slate that are unique to the game and add new dimensions to the gameplay. In my opinion it is the physics of BotW that make it such a strong game. The characters, world, music and story are all also great and they make up the complete package but they are held together with great gameplay and physics. Having said all that. It is just my opinion. I also really enjoyed Horizon Zero Dawn and wouldn’t want to choose between those two games. I see them as very similar in terms of the tasks to complete but very different in their settings, physics and their strengths. People claiming things are “overrated” just don’t understand what human experiences are all about. My experience in BotW and HZD was purely joyful from start to finish. So for me they weren’t overrated because I enjoyed them more than most of games I have played in my 30 years of gaming. TL:DR = Opinions, flaws and experiences on Breath of the Wild are all subjective and personal to each person. It is still a masterpiece of gaming achievement. Apparently it was the first two hours of the game. That's even better than what I thought was a short demo. So let's watch the language ok.
Perhaps this will be the first Kojima game I will like, but I still have my doubts. Regardless, I'm extremely curious about it. Reading this made me miss HZD - genuinely the only open world game I've ever finished. Loved it all.